More than 100 first-year University of New Mexico medical students are spending part of their summer in rural and underserved communities across New Mexico as part of a program that provides hands-on clinical training and could help address the state's physician shortages. 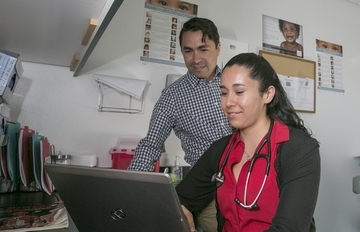 Through the UNM School of Medicine’s Practical Immersion Experience (PIE) – part of the medical school's internationally recognized curriculum – students are placed in outlying primary care practices for six-week rotations. In addition to providing valuable clinical experiences, the program addresses New Mexico's physician shortages because it can influence where students choose practice once they're out of school, according to Daniel L. Stulberg, MD, a professor in the UNM Department of Family and Community Medicine and PIE director. "The Practical Immersion Experience is a unique component of medical education here at UNM, teaching students about various cultures, patient empathy and the general health care system," he says. "Our students can quickly become attached to their patients and the communities in which they work." Students in the program are assigned to family medicine, orthopedic, women's health, cancer care and pediatric clinics, as well as rural emergency rooms and urgent care clinics. Their training includes conducting physical examinations and learning the important subtleties of clinical practice with guidance and supervision from preceptors. Medical students also are required to develop and carry out a community project designed to address health care needs specific to that community. 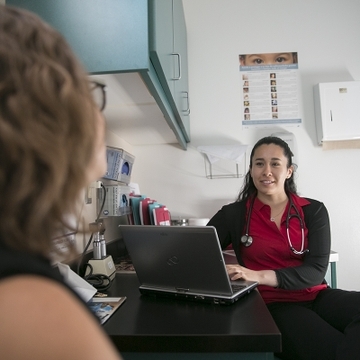 "This offers a great model for how we know our community and how we know our patients," says Steven Hartman, MD, a family medicine physician at El Pueblo Health Services in Bernalillo. Hartman, a 2009 graduate of the UNM School of Medicine, participated in the Practical Immersion Experience in Gallup following his first year of medical school. Now, he supervises student rotations at his primary care clinic Bernalillo. "My experience through medical school – the early exposure to direct patient care and clinical experience – really brought home the reason I went into medicine," Hartman says. The experience serves as a springboard for studying the sciences basic to medicine and gives students the opportunity to view medicine from a community perspective and to experience the lifestyle of the community physician. It's part of the reason Karissa Vasquez, a third-year UNM medical student, is now leaning toward a career in family medicine. "It gave me a lot of early patient exposure," Vasquez says of her first-year clinical rotation in Gallup, adding that she plans to practice medicine in New Mexico after finishing her residency. The SOM’s rural medicine program was ranked second in the U.S. in 2016 by U.S. News and World Report. The program has earned and sustained this national ranking over the past two decades. This year’s UNM PIE medical students are working in practices through July 29 in 38 New Mexico communities: Alamogordo, Albuquerque, Angle Fire, Artesia, Bernalillo, Carlsbad, Chaparral, Chinle, Clovis, Crownpoint, Dulce, Embudo, Española, Estancia, Farmington, Fort Defiance, Gallup, Grants, Isleta, Las Cruces, Las Vegas, Los Alamos, Pecos, Pojoaque, Reserve, Rio Rancho, Roswell, Ruidoso, San Felipe, Santa Ana, Santa Fe, Santa Rosa, Shiprock, Silver City, Socorro, Taos, Tierra Amarilla and Zuni.